DNC is now indexed by Scopus and Z-math! The interdisciplinary journal publishes original and new results on recent developments, discoveries and progresses on Discontinuity, Nonlinearity and Complexity in physical and social sciences. The aim of the journal is to stimulate more research interest for exploration of discontinuity, complexity, nonlinearity and chaos in complex systems. The manuscripts in dynamical systems with nonlinearity and chaos are solicited, which includes mathematical theories and methods, physical principles and laws, and computational techniques. 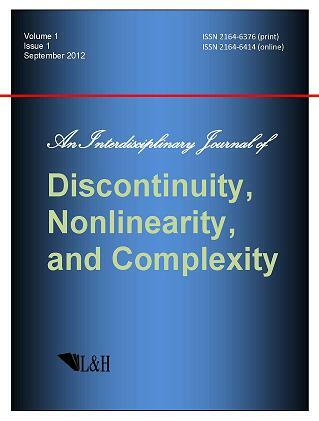 The journal provides a place to researchers for the rapid exchange of ideas and techniques in discontinuity, complexity, nonlinearity and chaos in physical and social sciences.